I saw this recipe on somewhere on facebook and saved it (LOVE that fb feature!) so when I needed to make a dessert for Easter supper, it is what first came to mind. Especially because I had every ingredient already on hand except for the oats. Preheat oven to 350 degrees. Mix together first 4 ingredients. Put oats in a food processor and blend until ground into a flour. Mix oat flour with salt and cinnamon. Mix oat mixture into the peanut butter/coconut oil mixture until fully combined. Pour into 8x8 inch baking dish (doesn't need to be greased). Melt chocolate with the 2 Tbsp of coconut oil. I used the microwave at 50% power for a minute and did additional 30 second intervals until it almost all melted and I could easily mix it together. Pour on top of the peanut butter later and smooth out. Bake for 18 minutes and cool on stove top. Place in fridge to set for at least 2 hours. Store bars in fridge or freezer. Enjoy! My husband said these tasted like really good chocolate peanut butter granola bars. These were pretty easy and I'd definitely make them again. If you make them let me know what you think! I realize I've been a complete blogging slacker. I don't know why I thought I'd have more time for this being a stay at home mom but I definitely have less haha. I can't promise how often I will post but I have some fun posts to share (including this one) that I hope to get around to soon. 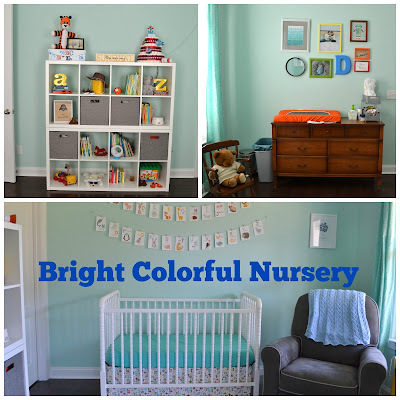 The nursery in our home is probably the most decorated and most complete of all the rooms. I had a vision for it and it came together just like I hoped... this room makes me so happy! I shared the painting of the aqua nursery here. I didn't want a particular theme in the nursery and wanted it to be bright and colorful and happy. I knew I wanted animals in it but not all themed around one animal. After finding the crib skirt and curtain fabric everything came together to go along nicely with those. The source list for everything I can remember, is at the bottom. On the left wall after you enter is the cube organizer that contain toys, books and a few bins. Two of the bins serve as laundry hampers and the other two hold blankets, babywearing wraps and extra wet bags. The door on the right side of the cube shelving is the closet... redo here. Two of my favorite things on these shelves are the Hobbes that Dexter confidently points to when you ask him "where's Hobbes?" and the Star Wars print which was the first thing Eric and I bought for baby at a vintage bi-annual market when I was pregnant. It says "Dad, you are my father". The opposite wall of the entry door has the crib and glider recliner. I've always loved the vintage look of the jenny lind crib. I spent many many hours in that chair and it was totally worth every penny. Since it is microfiber it cleans easily which is important when you have a reflux baby :) The flashcards and thumbprint frame with thumbprints from people at my showers are two of my favorite part of the nursery. I have always loved the look of hanging flashcards in a nursery and it was the perfect way to have animals without it being too themey. The final wall to the right of the crib has two windows and a little side table next to the glider. It was the perfect size for my water and phone and any other essentials while nursing. It was originally pink and my parents painted it yellow for us. My rocking chair and teddy bear from when I was a child are also on this wall. I had planned to add pictures or something on the wall in between the windows but haven't yet. Over a year later and I still love this room. Good thing since I go in here many times a day!